I’m thinking too far into a hopeful future. But, that is my faith. Maybe one day or year, Americans will no longer fall for divisive politics. One day, we will pause and look around to see everyone as allies with the same dreams. Celebrate Imani and the new year with a refreshing Lemon Basil Sorbet. Celebrate Kuumba with a sausage and okra soup by Sharee of “Savory Spicerack” that is quick and easy to make. A Kujichagulia salute to Maya Angelou’s “Still I Rise” and @ChefandSteward’s Jamaican Christmas Sorrel Drink. In the spirit of Umoja, Julia Turshen of “Feed the Resistance” shares her Angel Food Bread Pudding with Butterscotch Sauce and talks about volunteering at Angel Food East. 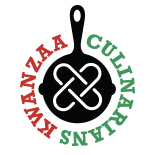 #HappyKwanzaa 2016: We’re unplugging for the rest of the year to freshly start anew in 2017. If Imani is the belief that a better world can be created for communities now and in the future, I have faith in today’s young adults. Read more and get the recipe for Roast Sweet Potatoes Stuffed with Spiced Couscous and Yogurt. In a Q&A with Pierre’s Thiam of “From Senegal: Modern Senegalese Recipes from the Source to the Bowl,” learn more about Senegal and get the recipe for his Chicken Thighs served with Red Palm and Coconut Rice.